Making a model to explain a concept is not a bad idea. 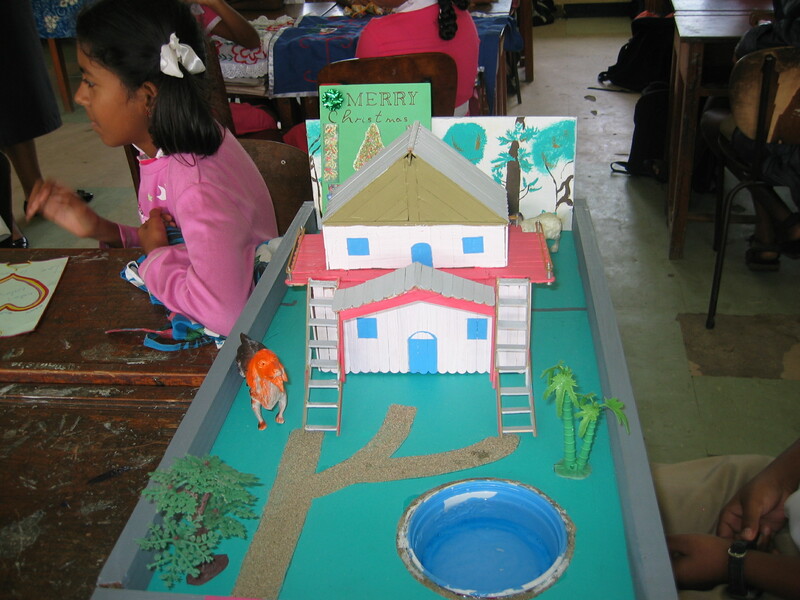 In schools throughout the world, students engage in projects where they are expected to produce models and artefacts. 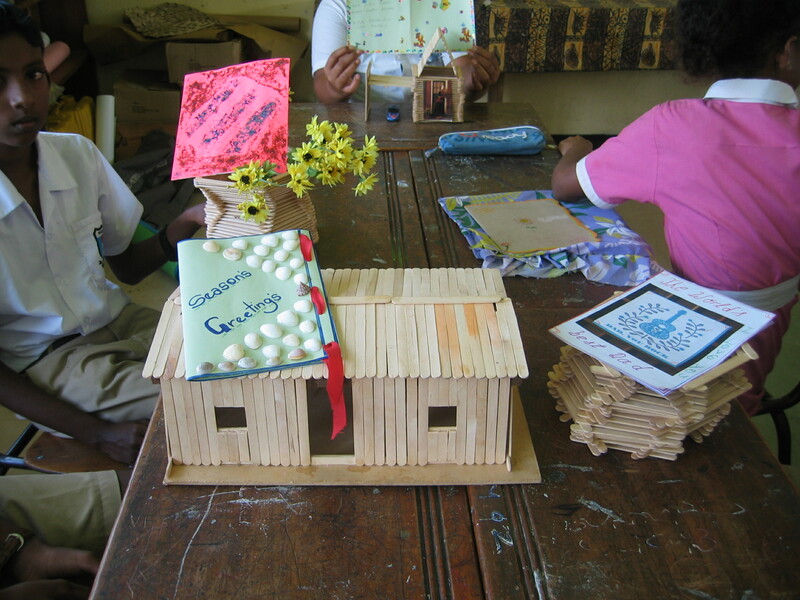 For example, these are models that were created by students for a year 6 Art and Crafts project. There is a lot of value in such projects. With computers, virtual models can be created. While these may not replace actual models, they can engage students in challenging activities. There are various applications that can be used for such an activity. 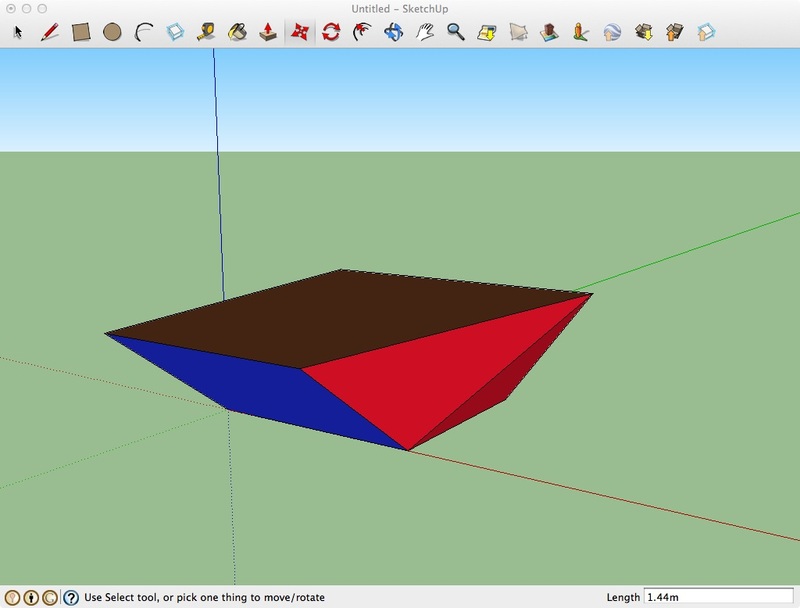 Google Sketchup is an application which works with Macs and PC’s. There is a free version and a pro version which has a cost. 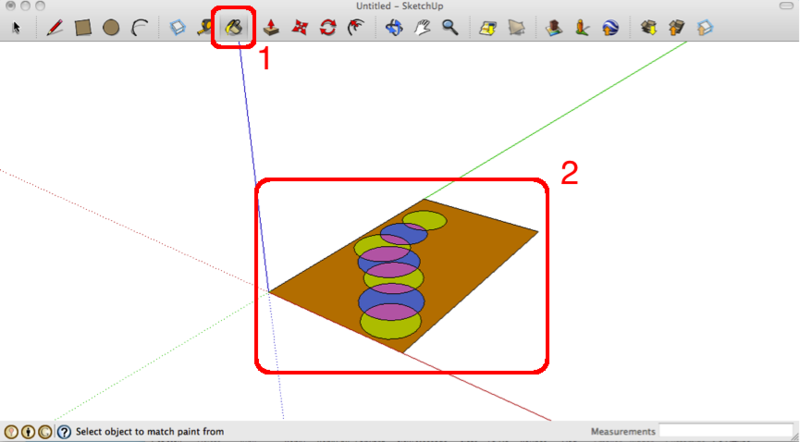 Google Sketchup enables users to create two and three dimensional (2D & 3D) models. In the process it demonstrates their design and creativity skills. Good designs also draws on learners knowledge of mathematics, science, technology and engineering. For example, in some designs they need to understand about measurement, shapes, angles, areas and volumes (mathematics knowledge) before they create their models. A program such as this can also develop spatial thinking. When you open the program, you will see the following page. You can un-tick(1) if you do not want to see this window all the time. Click start using the program(2). When opening the program for the first time, you will be asked to choose a template. Choose one that allows you to measure in metres. 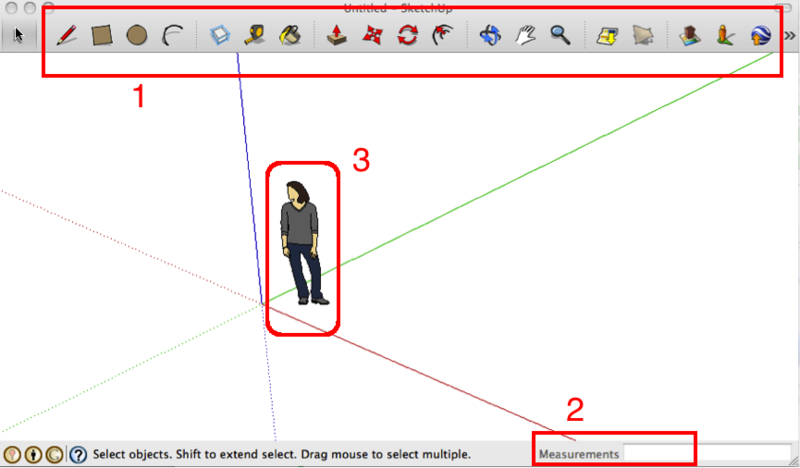 The important aspects of the next page are: (a) toolbars(1) – this enables users to create their models; (b) measurement box(2) – this gives dimensions of measurements, and (c) clipart (lady) – she gives an idea of the perspective. It can be deleted by scrolling the mouse over it and then hitting the delete button. 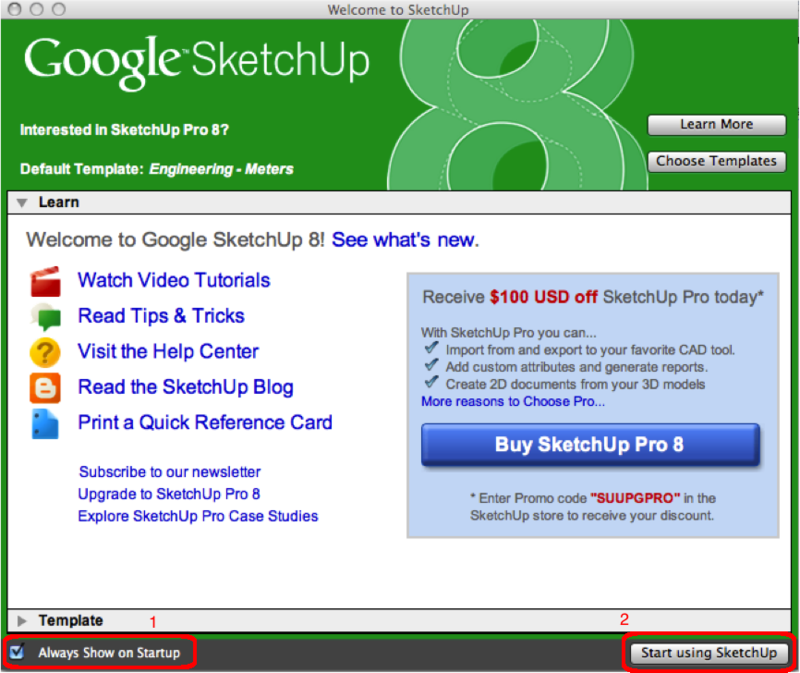 The INSTRUCTOR window outlines how the tools in Google SketchUp work. It usually opens when a tool is selected. If this window is not open – you can open it from the drop-down menu in WINDOWS . The SELECT tool is used the most. You can change existing entities e.g. the side or edge of a model using this tool. 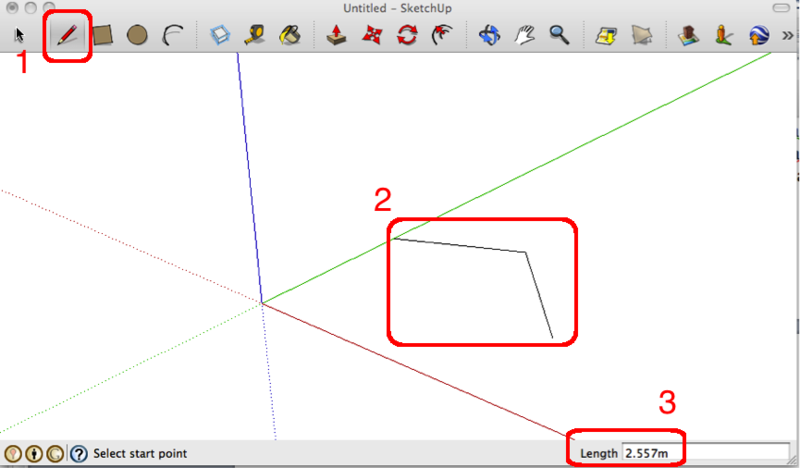 The LINE tool(1) can be used to draw lines(2). Notice that you keep track of the measurement associated with the lines in (3). They can be join to draw 2 and 3D shapes. The RECTANGLE(1) tool makes rectangles(2). In this case a rectangle has been made which measures – 3.833m by 1.297m (3). Circles(2) can be drawn with the CIRCLE (1) tool. In this case, a circle with a radius of 2.050m had been drawn. The ARC (4) tool draws arcs. This PAINT BUCKET(1) tool is useful for painting surfaces to suit the needs of the sketch. It is simple to use – select the Paint Bucket Tool, choose the desired colour, then click the paint bucket on the desired section of sketch(2). This PUSH/PULL tool converts a 2D shape into a 3D shape. 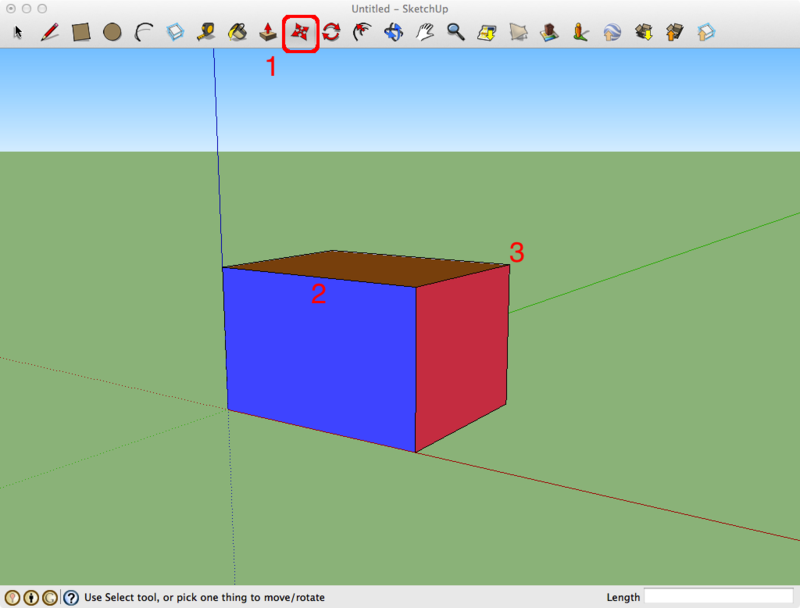 The diagram below shows a rectangle(2D) that was converted to a cuboid(3D). This one step conversion makes this tools very convenient to use. 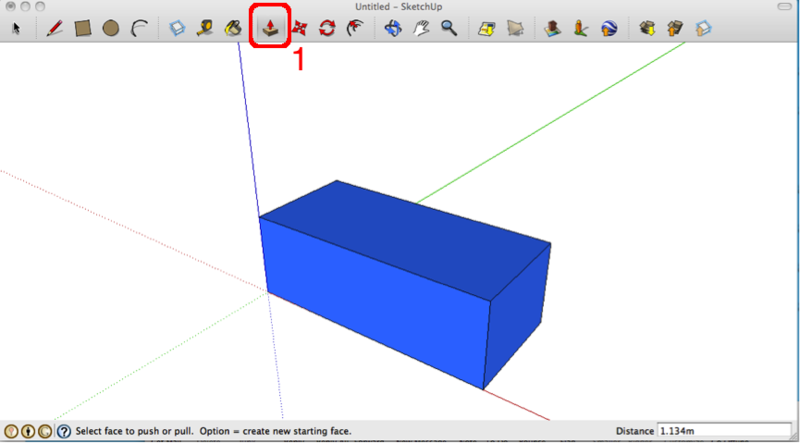 The tool is used to either push or pull on a 2D shape to convert it into 3D. 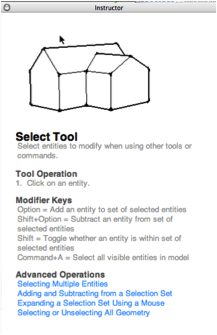 The MOVE(1) tool can be used to transform entities. 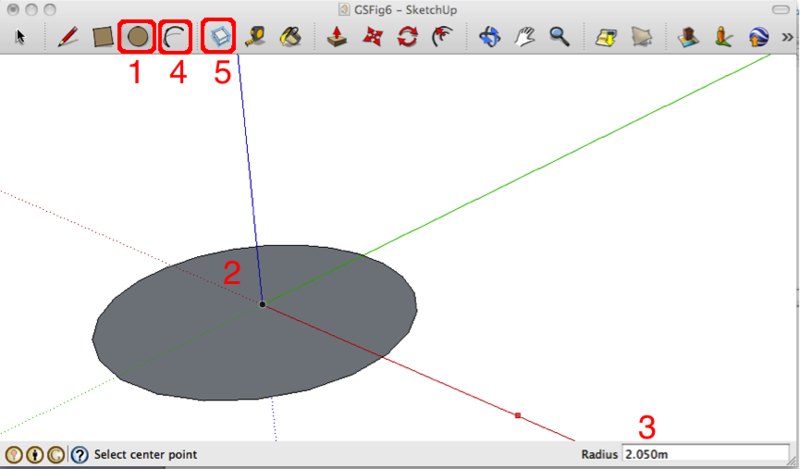 This can be done by placing the cursor on a point, edge or surface. 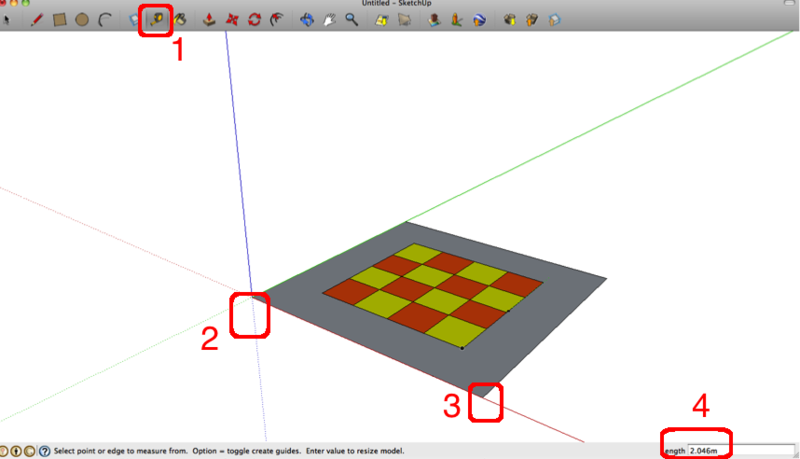 The cuboid in Figure 1 was converted to the shape in Figure 2 with the MOVE tool. An edge(2) and a point (3) were moved to create this new shape. Explore these tools on your own. Using the ROTATE Tool, entities such as a rectangle can be rotated, stretched, distorted or copied along a circular path. The OFFSET Tool can be used to create similar shapes such as concentric circles. It is useful in creating a shape within a shape. It can be useful in creating designs for landscaping projects. The ORBIT Tool can be used to rotate a camera around a model. It gives a 3D perspective of a shape and enables the viewing of a model from different perspectives. 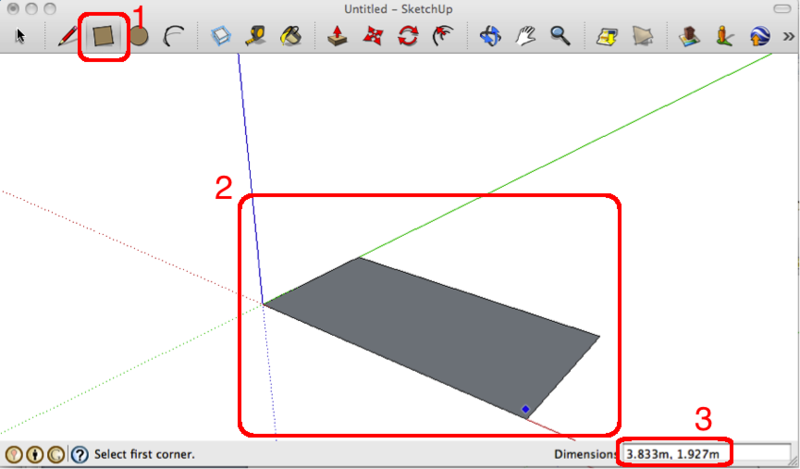 Similarly the PAN Tool can be used to view a model both horizontally and vertically. The ZOOM tool works like lenses in cameras. It allows a close up and distant view of a model. Other tools such as the ADD LOCATION and the GOOGLE EARTH tools need Internet access. Through tools such as these, the models can be viewed in perspective e.g. a bus shelter for a particular school. This is a link to a website which has more ideas on how this tool can be used for learning activities across different year levels. This teacherguide also has a number of ideas.